She's such a delightful addition to our family. I wish I had more time to spend with her during the day. As of today, Abi's had about 20 echos done of her heart. 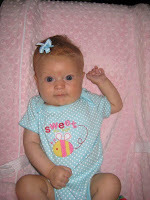 The first one was done when she was a 18-week old featus and the last echo was done on November 10th - last week. We are awaiting a second opinion from the Atlanta's team and a decision about her first surgery (putting a Band over her Pulmonary Artery). Our local cardiologist suggested that temporary solution as a first step of helping Abi to breathe and gain weight better.